Producers, exhibitors and media from around 48 countries expected at pork-specific event. The 28th annual World Pork Expo kicked off today at the Iowa State Fairgrounds in Des Moines, Iowa. Presented by the National Pork Producers Council (NPPC), the expo features the world’s largest pork-specific trade show, educational seminars, national youth swine shows, open shows and sales, as well as tasty grilled pork and more. Producers, exhibitors and media from approximately 48 countries are expected at this year's event, which runs through June 10. The World Pork Expo is in full swing this week in Des Moines, Iowa. Weber encouraged attendees to stop by the NPPC booth or hospitality tent to visit with the staff and leadership who advocate for pork businesses every day. “It’s an opportunity to learn about what’s been achieved and what lies ahead,” he added. 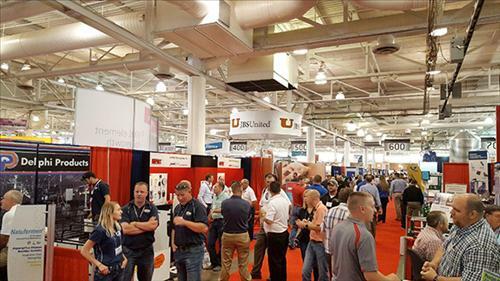 The trade show is the centerpiece of the expo, giving pork producers a one-stop venue to compare products, services and technologies from hundreds of companies based in North America, Asia and Europe. Every year, the World Pork Expo provides pork producers with the most up-to-date information. Specifically, the expo hosts seminars to address business management, production technologies and future developments affecting pork producers. “There’s certainly something for everyone, and we want every attendee to walk away from expo with insights that are useful and beneficial to them,” Warrick said. Stay up to date on all of the events and activities by connecting with the World Pork Expo on Facebook, follow Expo on Twitter (#WPX16) and download the free mobile app by searching “World Pork” in the Apple Store, Android Market or Blackberry’s App World. The World Pork Expo Junior National is ranked among the nation’s premier youth swine shows. This year, a record 1,290 youth from 32 states will participate in a variety of events, including a Skillathon, judging contests, certification programs and live hog shows. Hosted by the National Junior Swine Assn. and Team Purebred, the Expo Junior National began June 6, with events and shows running through June 10. All activities will take place in the Swine Barn. As a special feature, classes in one of the two show rings will be live-cast as well as recorded for future viewing. Total entries for both the Junior National and the open shows are projected to display 3,800 hogs, up slightly from the 2015 level of 3,200 hogs.